President Centre for Pakistan and Gulf Studies, Senator Sehar Kamran (TI) expressed sorrow over the unfortunate crash of the PAF trainer jet that resulted in the martyrdom of the Pakistan Air Force (PAF) Flying Officer Marium Mukhtiar. She has become the first female pilot to have died on a mission when a technical fault resulted in the crash of her jet near Kundian, Mianwali. Senator Kamran conveyed her condolences to the family of Ms. Mukhtiar and said that her heart goes out to them at this time of mourning and loss. Senator Kamran also said that the Flying Officer’s career and her martyrdom is a testament to the fact that women in Pakistan today are as much involved in defending the borders as their male counterparts. She said the life of Ms. Marium Mukhtiar is an inspiration for women all around the world, and her name will remembered in the history of Pakistan. President Centre for Pakistan and Gulf Studies (CPGS), Senator Sehar Kamran (TI) led a two-member CPGS delegation participating in the two day European Union Non-Proliferation and Disarmament Conference on 11-12th November, organized by the International Institute for Strategic Studies (IISS) in Brussels. The conference was attended by 300 experts including the Director General International Atomic Energy Agency (IAEA), Yukiya Amano as well as other prominent dignitaries and experts. The speakers and participants discussed issues related to nuclear proliferation and other threats. The Iranian Nuclear deal was discussed at some length, with most participants being of the view that the deal would prove helpful for fostering peace and stability in the stability in the region. Another current issue under debate was the role of nuclear weapons in light of the Ukraine crisis, and the resultant rise in tensions between Russia and the USA. Additionally, speakers from across the globe emphasized on further nuclear weapons reductions in P-5 nuclear weapons countries, especially the US and Russia. In this context, the imminent speakers and participants suggested substantive, tangible and concrete steps to prevent the further proliferation of nuclear weapons. 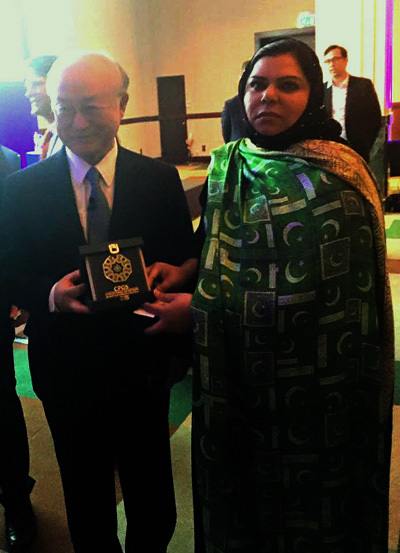 President CPGS, Senator Sehar Kamran, while representing the Centre and Pakistan, met with distinguished guests including DG IAEA Yukiya Amano, Adviser to the Vice President and Head of the Atomic Energy Organization of Iran, Ambassador Ali Asghar Soltanieh, Pakistan’s Ambassador to Belgium H.E. 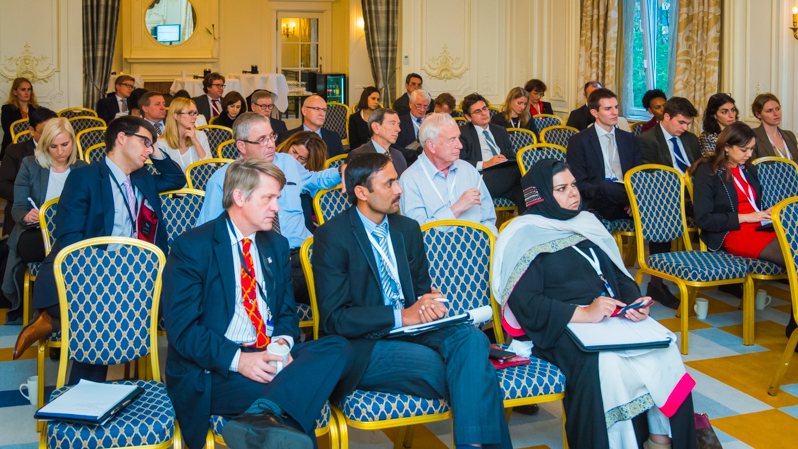 Ms Naghmana Hashmi, IISS Director Non-Proliferation and Disarmament Programme Mr Mark Fitzpatrick and many others. Senator Sehar Kamran also intervened in discussion and raised the issue of double standards and discriminatory policies of a ‘politically-dominated’ nuclear regime regarding the civil nuclear energy deal. She stated that major powers have adopted a ‘discriminatory’ approach, providing a civilian deal to a select few, while Pakistan, which has strong nuclear fuel cycles expertise in addition to extensive experience in handling and running nuclear power plants, is being denied the same as a result of the lack of a criteria-based aproach. During discussions with Mr. Fitzpatrick, Senator Kamran (TI) highlighted the urgency of Pakistan’s energy needs and importance of access to civil nuclear technology in this context. Mr Fitzpatrick praised the role of CPGS in initiating a project as vitally important as ‘JOHAR “Contemporary Debate in the 2nd Nuclear Age”’. He added it is positive that today there is talk of a Civil Nuclear deal with Pakistan; when he first raised the possibility of offering such a program at Vienna in early 2015, many eyebrows were raised. He further reminisced that the first time nuclear veteran Dr. Peter Lavoy discussed a possible ‘Pakistan-USA’ nuclear deal was at the CPGS seminar on “Nuclear Non-proliferation, Arms Control and Disarmament: Contemporary Challenges and Prospects”, held on May 7, 2014. Now that a narrative has been built, with an increasing number of scholars, including Toby Dalton and Michael Krepon, genuinely considering and promoting the idea of “a normal Nuclear Pakistan”, talks on civil nuclear relations between Pakistan and the US can continue to improve. The new debates in this context will be regarding procedures and conditions, which can be negotiated. 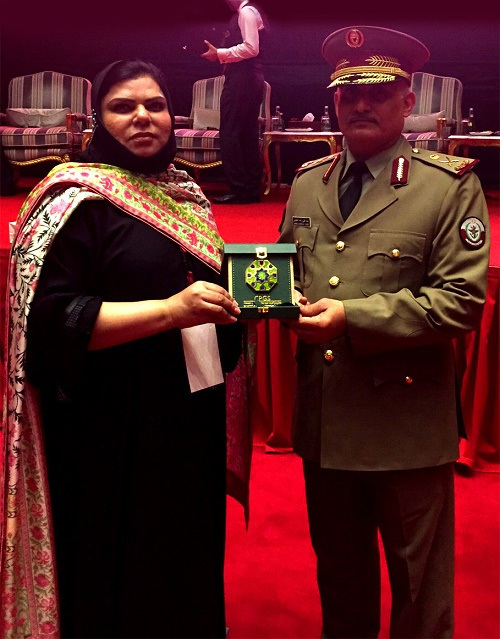 October 29, 2015: President Centre for Pakistan and Gulf Studies (CPGS), Senator Sehar Kamran (TI) participated in the two day international conference on ‘Middle East Crises between Regional and International Policies – Vulnerability and Influences’ organized by the Qatar Armed Forces at the Doha International Strategic Policies Forum, DISP 2015 on 27-28th October. Senator Sehar Kamran met with the high ranking eminent members of the Qatar armed forces and other delegates from various countries during the conference. Discussion on matters of mutual interest and collaboration between CPGS and research institutions of Qatar were also held. Islamabad, September 16, 2015: While speaking on a matter of public importance, President Centre for Pakistan and Gulf Studies, Senator Sehar Kamran (T.I.) urged Chairman Senate to request the Prime Minister Nawaz Sharif to come to the house and take people in confidence before going to the US to address the United Nations General Assembly. Ms Kamran regretted that the government was openly saying that the Kashmir issue had been excluded from the Ufa declaration on India’s request. “Why do we make compromises on national interests?” she asked while referring to the declaration that was issued after the meeting between Mr Sharif and Indian Prime Minister Narendra Modi in Russia in July. Senator Kamran inquired about the status of action on the ceasefire violations committed by India and said how long can we continue to condemn these incidents? She said what we need is a comprehensive policy to counter the increasing threat perception and the public should be informed as to what has been communicated to stop the consistent violations of Line of Control and the breach of sovereignty of Pakistan. Lastly, she said despite her insistence there has been no briefing on the national security policy of Pakistan, she requested the house that a briefing be arranged to take people in confidence. Senator Sehar Kamran said the national interests of Pakistan are supreme and they should not be compromised because of certain individuals’ business interests. 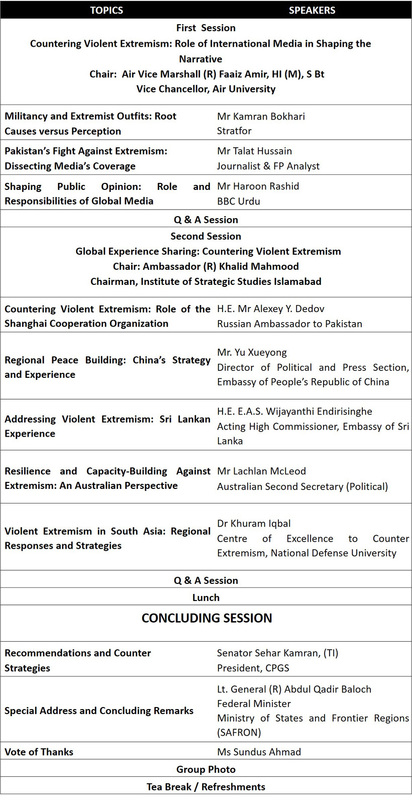 “The complex challenges of terrorism and violent extremism defy simplified solutions. The causes of terrorism and violent extremism are multiple and need a comprehensive response from the international community,” stated Senator Sehar Kamran (TI), President CPGS. She further recalled that Pakistan was one of the countries that had been hit hardest by the phenomenon, but has resiliently fought back to control its spread. The remarks were made during her opening address at a Two-Day International Seminar on ‘Countering Violent Extremism: Global Action Plan’ was organized by the Centre for Pakistan and Gulf Studies (CPGS) in collaboration with German foundation Konrad Adenauer Stiftung on the 9th and 10th of September 2015 at the Pakistan Institute for Parliamentary Services (PIPS) Islamabad. The Seminar culminated in the presentation of a series of Policy Recommendations by the Centre for Pakistan and Gulf Studies. The recommendations stressed upon the need for developing a framework mechanism with a consultative mandate by an appropriately representative platform such as the United Nations that could help member states develop their capacity to identify extremism and curb violent extremism at a local level. The document categorically rejects the identification of violent extremism with any one religion, sect, culture or region. The recommendations further call for addressing the root causes of terrorism and extremism via multilateral, transnational efforts that involve encouraging the participation of local communities to develop values and norms of peaceful coexistence in truly pluralistic societies. The Centre urged that an environment conducive to such progress cannot be established unless policies based on ‘exclusion’ along racial lines and parochial prejudices are abandoned, and all-inclusive polices adopted. The Two Day Seminar was also attended by ambassadors, diplomats, academic scholars, senior media representatives, politicians, members of the academia, defense community, lawyers, university students as well as members of civil society. Islamabad, August 21, 2015: President Centre for Pakistan and Gulf Studies, Senator Sehar Kamran (TI) has condemned the cancellation of scheduled peace talks between Pakistan-India’s National Security Advisers’. She said the aggressive position taken by India ahead of the talks and the ultimate cancellation of talks depict Indian non-seriousness where peace of the region is concerned. She said Kashmir is a core dispute and any talk between the two countries without the mention of Kashmir will be meaningless as Kashmir is the jugular vein of Pakistan. Senator Kamran said Indian pressure to terminate Pakistan’s National Security Advisor’s meeting with the Kashmiri leadership of Hurriyat was condemnable as he was due to meet the Kashmiri leadership during his trip. Furthermore, she stated the lack of mention of Kashmir dispute by Pakistan in the Indo-Pak Prime Ministers meeting in Ufa has encouraged India to exert pressure on Pakistan. Senator Sehar Kamran said such Indian hostility will bring nothing but instability and will be detrimental to the peace and security of the region. Pakistan wants peace and stability in South Asia but peace offering by Pakistan should not be mistaken as a sign of weakness, she added. Islamabad, August 14, 2015: On the occasion of the 69th independence day of Pakistan, President Centre for Pakistan and Gulf Studies, Senator Sehar Kamran (TI) has expressed her heart-felt felicitations to all Pakistanis. She said this day is a reminder of the aspirations, sacrifices and services rendered by our ancestors, because of whom we are available to live our lives with dignity and freedom in our homeland. Senator Kamran said today Pakistan is fighting a war of its survival on multiple fronts. The scourge of extremism has taken deep roots in the society. She said with the Operation Zarb-e-Azb successfully going on in the country, it is pertinent we capitalize on the successes achieved. Furthermore, she paid great tribute to the people of Pakistan who have shown extraordinary resilience in the face of great adversary. Senator Sehar Kamran said Pakistan is our identity, which we have earned by rendering numerous sacrifices. She urged that we renew our pledge for a progressive, prosperous and peaceful Pakistan.